Much of history is quite boring. This happened, which led to that, and on and on. But the best part of history is clear and unexpected turning points. It’s exciting when we can point to one moment, one person and in this case, one bunker that changed the way golf courses were designed thereafter. This is precisely the story of Woking Golf Club, originally founded in 1893 in Surrey, England with a fairly dull design by Tom Dunn, a penal style architect. This isn’t meant as an insult to Dunn, the penal school was basically the only one in existence at the time. Up until then, everyone thought penal design to be correct. It was believed that the worse the shot, the greater the punishment should be, which meant bunkers would be more severe the further they were from the middle of the fairway. At the time of Woking’s opening, golf was thought to be a sport played on the ocean. The natural and rugged terrain of oceanside courses paired with ideal grass and soil made for the best golf courses. It took years for inland (otherwise known as heathland) courses to be built, and Woking was one of the first. These courses were seen as worse than coastal courses for several reasons, but mainly because they were boring. The beauty and natural contours of oceanside courses brought excitement and strategy even before golfers understood why. The heathland setting and penal design led to boring, second-class golf. But this all took a turn when two members started to make changes to Woking over the span of forty years, John Low and Stuart Paton. The par-4 4th hole at Woking was straightforward with a wide fairway that bordered the train tracks on the right and a bunker on the front of the green. One day, without telling anyone of his plan, Paton dug a fairway bunker slightly left of center modeled after the principal nose bunker from the 16th hole at St. Andrews. Combined with the front bunker, and a front left-to-back right sloping green, the hole instantly became one of great strategy. The player has two options: they can take the aggressive line right of the bunker, which gives the better angle into the green with the second shot but risks going out of bounds onto the train tracks, or they can bail out left of the fairway bunker, which leaves a very difficult approach over the greenside bunker into the green. It was the first time in heathland golf that a bunker was built to test the best players and how they wanted to attack the hole. Rather than only punishing the bad player for their miss hits, this bunker enticed the better golfer to take on the risk of a better line. But at the time, everyone was still too entrenched in the ideas of penal design, and most of the members of the club were quite angry about the changes made to number 4. 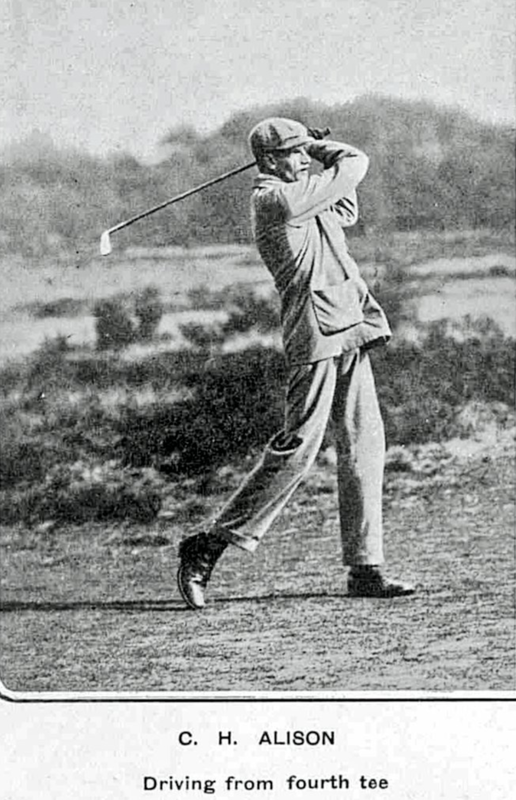 While it was Paton that dug the bunker, Low took much of the heat over the years for his design philosophies and the many essays he wrote on the topic. In 1905, new bunkering was added to St. Andrews that was not well-received, and the blame was put squarely on Low. It was hard for people to give up the “logical” system of penal design, and they felt bad shots needed to be punished more than good ones that were only slightly off-line. This, both sadly and surprisingly, sounds pretty similar to golf today. People are always looking to make courses harder and “fairer”. Much of golf is now filled with narrow fairways with high rough and/or trees on either side, flat fairways, and greens that are meant to hold aerial approaches. John Low grew up playing Carnoustie and the Old Course at St. Andrews and inherited the Cambridge golf team captaincy from Harry Colt upon his arrival. He was not concerned with making golf courses fairer, he wanted them to be more fun. Everything didn’t have to be so logical in his mind. Like at St. Andrews, he believed luck was part of the essence of the game. He once said, “The true hazard should draw play towards it, should invite the golfer to come as near he dare to the fire without burning his fingers.” Many people believe changes in architectural principles come about gradually, over a long span of time. That, however, is not the case here. This is one of those historical turning points. The Simpson story goes, on a rainy day at Woking, others were complaining about the 4th hole bunker while sitting around the clubhouse. Simpson decided the rain wouldn’t stop him from examining the hole. Seeing it, he realized all the possibilities that came with a strategic design and spent the whole day exploring that one hole. He returned to the clubhouse wet but with a smile on his face, and soon quit his job at a law firm to begin designing courses. It's easy to see why much of the public would be attached to penal design principles. They agree with our common sense and are simple enough for everyone to understand. The worse a shot is, the more it should get punished. It aligns with everything else we do in life, where we immediately perceive the punishment for our mistake. The bunker dug by Paton was the tipping point from penal to strategic principles. While the immediate penalty of penal design makes sense to most, strategic design principles are all about delayed penalty. It is not on the shot where you will see your mistake in strategy or execution, but only when you reach your ball will you realize how dead you are. The 4th at Woking is a prime example. If you bail out left of the bunker, you might feel fine. Your whole walk up to your shot, everything might still seem good. But the moment you line up your shot, and realize your slim chances, it will be impossible for the genius of strategic design not to make sense. With penal design, you know right away you messed up, and you likely won’t have any chance to recover. The brilliance of strategic design is the delayed penalty and the ability to recover with a miraculous shot. The good news is, the future of golf course architecture looks promising. There is a resurgence of strategic design principles throughout the game, spearheaded by the most popular current architects like Coore and Crenshaw, Gil Hanse, Tom Doak, and many others. Like anything else, good golf design comes and goes; there are waves of brilliance, and dark ages of water and trees. The cliché is true, history does always repeat itself. It is difficult to hold steady with strategic architecture at times, as penal design principles come easier to common sense. It is sometimes harder to convince people to go along with with a system of delayed penalty, but the reward is always worth the initial risk (as is often true on the golf course). The hope is that we won’t need more turning points like Woking in the future, but we can just keep pointing back to what we have learned from the greatest architects and their great courses. Woking may have jumpstarted the first Golden Age, but we may be at the beginning of a second, and all we needed was to look back at what we learned the first time around. "For anyone who really wants to be a golf architect, I heartily recommend Woking as one of the most rewarding courses in the world you can see."